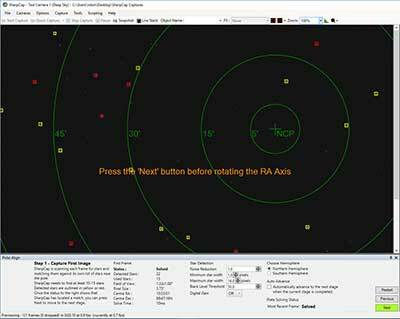 Align the RA Axis of your astrophotography mount to the North Celestial Pole using Polar Alignment in SharpCap Pro. This procedure is quick and easy and can make a huge difference to your astrophotography. SharpCap Pro introduced the Polar Alignment feature in version 2.9, and backyard astrophotographers have been taking advantage ever since. This useful feature can make a big impact on your astrophotography tracking and guiding accuracy. In this post, I’ll briefly cover why I think you should start using SharpCap for astrophotography, and how to use the Polar Alignment feature to improve your images. SharpCap is an extremely easy-to-use astronomy camera capture tool, and I use it to frame and focus my target when using a CCD Camera for a night of imaging. SharpCap supports a wide variety of astronomy imaging cameras including models from Altair Astro, ZWO, and QHY. 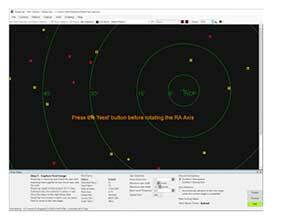 In fact, all astronomy cameras sold by Altair Astro in 2017 include a license to SharpCap pro. 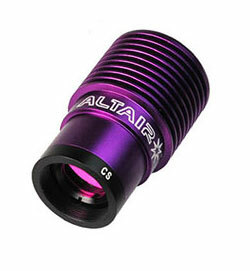 This includes the Altair Hypercam 183C I will be reviewing later this month. SharpCap was designed for dedicated astronomy imaging cameras, and can not be used with a DSLR. I think we can all agree that improving the accuracy of the telescope mount can improve our astrophotography images. A more accurate Polar alignment will be evident in your autoguiding graph, and in your individual image frames. My previous method of Polar Alignment involved using the Polar Finder app for a readout of the current night’s position for Polaris. While this method gave me good results, SharpCap can achieve a level of accuracy that rivals a QHY PoleMaster device. In the video below, I roughly demonstrate the Polar Alignment process in SharpCap pro. The fine-tuning I made to my telescope mount made a difference in my autoguiding graph. I will be using SharpCap for all of my future astrophotography imaging sessions to confirm the accuracy of my Polar Alignment. Basically, SharpCap takes two pictures near the pole and analyzes them to judge the accuracy of your Polar Alignment. SharpCap uses plate solving to scan the images and then tells you how much you need to move your mount to increase the accuracy of your Polar Alignment. The Altair Starwave 60mm guide scope pictured above has a focal length of 225mm, which is in the sweet spot for this Polar Alignment process. I found the process to be quite easy to understand and complete my first time through. The only hiccup I had was when I tried to use my primary imaging camera through the telescope to plate solve the images. The magnification of the long (714mm) focal length of my ED102 was way too much to make any fine adjustments. I later discovered that using my guide camera and guide scope was a much better option for using Polar Alignment in SharpCap. 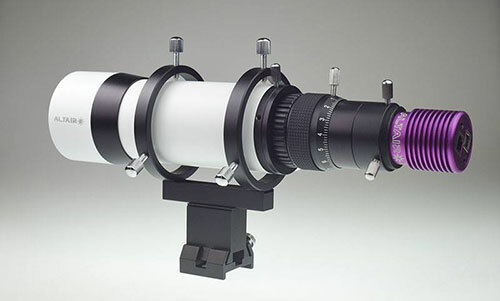 A guide scope in the 50mm-60mm range has the ideal focal length for this process. SharpCap explains that a focal length of about 200mm works best. My current autoguiding setup is the perfect combo for the SharpCap Polar Alignment process. 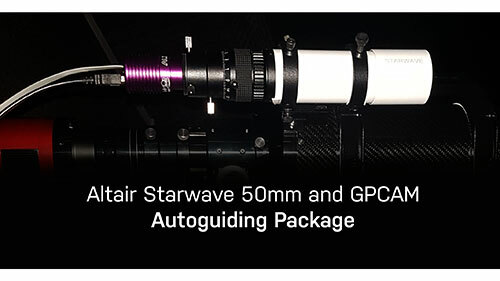 The Starwave 50mm Guide Scope and Altair GPCAM2 Package is the perfect combo for this Polar Alignment process. The highly-sensitive sensor in the GPCAM2 AR0130 Mono guide camera easily picks up enough stars to plate solve using a 4-second exposure. I currently use the GPCAM2 as an autoguider, but it also makes for a fantastic stand alone planetary or deep-sky camera. This camera was generously provided to me by my friends over at Ontario Telescope and Accessories. Thanks, Steve! SharpCap calls this the easiest Polar Alignment tool available. While I have never used a PoleMaster, I can agree that this method is indeed very easy. 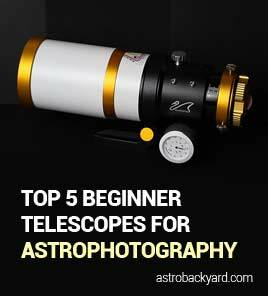 I performed this technique using a Sky-Watcher HEQ5 Equatorial Mount. I used my autoguiding camera and guide scope to capture the recommended field of view for this process. With all of these confirmed, you are ready to take the first step. Navigate to the Polar Alignment button in the main menu located within “Tools”. After clicking on Polar Alignment, SharpCap will try to plate solve the image coming from your guide camera. As long as you are close enough to the North celestial pole, and your field of view is sufficient, SharpCap will plate solve the image through your camera. Make sure you use a long enough exposure for your camera to pick up at least 15 stars. I used an exposure of 4 seconds with the GPCAM2. Under the Star Detection heading, increase the Noise Reduction value if your camera is picking up hot pixels and confusing them for stars. The yellow boxes represent the stars used to plate solve the image. Once you have succeeded in plate solving at least 15 stars in the frame, the status will change to “solved“. Now that your first frame has been plate solved by SharpCap, you can press NEXT to move onto the next stage. Unlock the RA clutch on your telescope mount, and rotate it a full 90 degrees. SharpCap will automatically continue to snap image frames and attempt to plate solve the new image. Once it confirms that the image has been rotated 90 degrees, it knows the exact position your mount is rotating at. This RA axis point may be out of your field of view, but SharpCap will display the NEXT button again if everything is in order. If you are not able to plate solve the image at this stage, try rotating the mount a little further. If the camera fails to pick up enough stars, start over with the corrected exposure and gain settings. You are now at the final stage of the process. You should see one of the brighter stars on the image highlighted in yellow with an arrow pointing to a target area close by. You just need to adjust the altitude and azimuth bolts on your mount to move the indicated star into the target. This will essentially line up your mount’s RA axis with the North Celestial Pole. There are some indicators below the Polar Align Error heading that you can use to aid in your adjustments. As you make small adjustments to the bolts, you will eventually get the star closer into the target area. When you are getting very close, the arrow and target will change to a set of parallel lines that need to be brought together. Complete Autoguider solutions including the GPCAM2 used in my video are available at Ontario Telescope and Accessories. For more information about the Polar Alignment process in SharpCap, you can visit their official website. 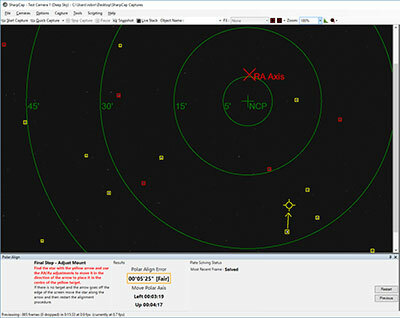 Polar Alignment in SharpCap.